Group Living - Planning, working, and playing in an organized experience so that desirable habits and attitudes, independence, and responsibility are established. Creative Activities - Self-expression through the use of paints, crayons, manual tools, and other materials. Field Trips - Visiting points of interest in the community to help the child establish appreciation of people who contribute to his/her life. Language Experiences - Enjoying stories, verse, conversation, and dramatization. Health and Safety - Learning good health habits, acquiring an intelligent understanding of safety rules. We believe that the church…. …is called to the congregation and the community. …is committed to assist persons to live in the fullness that Jesus proclaimed. We believe that each child…. …is a child of God. …has a right to develop to his/her full potential. We believe that the weekday program…. …should provide examples of the highest qualities of Christian faith. …assist parents in these crucial years of child rearing. …provide children the best early childhood education so that they may develop to their fullest potential physically, mentally, emotionally, socially and spiritually. We commit ourselves to a weekday program, which bring together the best we know about the education of young children and our highest understanding of the Christian faith. 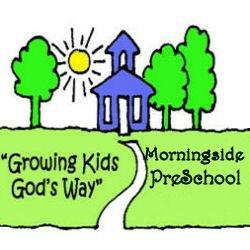 The Morningside Baptist Church Weekday Education Preschool admits children of any race, color, and national or ethnic origin. Our C.W.E. or Church Weekday Education program is designed to help your three and four year old grow academically, emotionally, and spiritually. View our comments page to read and post comments and suggestions about C.W.E. Click here to download our CWE informational package.